A giant hole in the moon, which opens at the Marius Hills skylight (pictured here), was formed by an ancient lava tube. 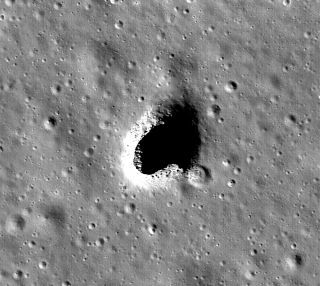 A city-size lava tube has been discovered on the moon, and researchers say it could serve as a shelter for lunar astronauts. This lava tube could protect lunar-living astronauts from hazardous conditions on the moon's surface, the researchers said. Such a tube could even harbor a lunar colony, they added. Humans first landed on the moon more than 48 years ago, but no one has managed to stay there for longer than three days. That's because the moon is a perilous place. It has widely ranging temperatures, and unlike Earth, the moon does not have an atmosphere or magnetic field to protect life on its surface from harsh sun rays and radiation. Spacesuits can't substantially shield astronauts from these dangers over long periods of time, but a lava tube could potentially help protect any space travelers, the researchers said. Lava tubes are channels that form when a lava flow cools and develops a hard crust; this crust then thickens and makes a roof over a still-flowing lava stream, they explained. Once the lava stops flowing, the channel sometimes drains, leaving behind an empty tube. Researchers want to study this lava tube because they "might get new types of rock samples, heat flow data and lunar quake observation data," Haruyama said. The tube was discovered when the Japanese lunar orbiter SELENE (Selenological and Engineering Explorer) — also known by its nickname, Kaguya — gathered data near the moon's Marius Hills skylight, which is the tube's entrance. When JAXA researchers later examined the data, they found a distinctive echo pattern: a decrease in echo intensity followed by a large second echo peak — signals that are largely suggestive of a hollow area, like a tube, they said. The scientists also discovered comparable echo patterns at several places near the hole, indicating there may be more lunar tubes in the area. However, SELENE wasn't designed to fly close to the moon, so JAXA partnered with NASA scientists working on the GRAIL (Gravity Recovery and Interior Laboratory) mission, a project that allows scientists to amass high-quality data on the moon's gravitational field. Areas of the moon with gravity deficits — that is, less mass — could help indicate hollow places underneath, they reasoned. Earth also has lava tubes, but they're not nearly as large as the one discovered on the moon. If the scientists' gravity analyses are correct, the lava tube near Marius Hills could easily house a large U.S. city such as Philadelphia, they said. The city of Philadelphia could easily fit inside a theoretical lunar lava tube. Other scientists have speculated that the moon has lava tubes, but the new finding, which combines radar and gravity data, provides the best evidence and estimates of how big these tubes are, the researchers said. This finding may go a long way: When meeting with the recently re-established National Space Council on Oct. 5, Vice President Mike Pencereiterated that the Trump administration will focus on sending astronauts to the moon rather than to Mars. "The moon will be a stepping-stone, a training ground, a venue to strengthen our commercial and international partnerships as we refocus America's space program toward human space exploration," Pence said at the council meeting, according to a statement from the White House. The study was published online Oct. 17 in the journal Geophysical Research Letters.